Jordon McClain is the Founder and CEO of a small indie game company called Steel Cyclone Studios. While working full-time to support himself, Jordon is a self-taught Game Artist, Designer and Developer in his spare time. Jordon is creating several video games built upon his in-house engine known as the Cyclone Game Engine. The Cyclone Game Engine is a 2D/ 3D game engine built upon MonoGame and the XNA Framework to help make it easier and save time creating games. The game engine is not perfect by any means. The game engine is still in its infancy stages of development which is why its not available yet to the community. The Cyclone Game Engine is primarily built to serve the needs of Steel Cyclone Studios' game projects. Once it is further developed, Jordon plans on releasing it. Jordon's ultimate aim is to make it into the video game industry and join the greats of game designers. In the meantime, Jordon is trying to hone his skills and learn as much as possible. 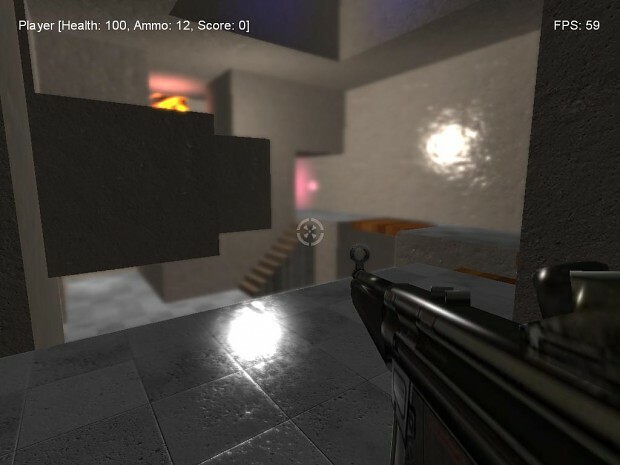 The XNA First-Person Shooter Starter Kit was originally developed by Fabio Policarpo in XNA 3.1. It is based off his Ship Game Starter kit. This starter kit allows developers to understand how to develop their own FPS game based on the XNA Framework. If you are not a fan of XNA, you can port it to other languages by understanding some of the building blocks associated with these types of games. I am converting the XNA FPS Starter Kit to XNA 4.0 and MonoGame. This particular first-person shooter kit has been modified to support LAN or Internet play for Xbox Live. You are free to use the source code as a basis for your own first-person shooter game project, and to share your work with others. I have uploaded the XNA 3.1 version of the starter kit and made it available for download. I will be uploading the updated source code soon after I have converted it. The Cyclone Engine Indie DB Page is up! I will be posting the Cyclone Engine's Progress Videos and updates there. Hey, me and ghost59 are currently trying to make a new bigger indie company. we are doing this to show that indies are strong and can make great games fast and easy. We would like you to join us. You will keep your company name if you join, its basically like one big company name then your company would be put into a section and work on certain things, in your case you would work on a engine, graphin novel, and games(like you said). we will find people to help you with the engine's development or anything else. We would love for you to join us, if you have skype me and ghost can explain more on there. Please message me back asap. That is great that you all are trying to make a bigger indie company. At this stage it wouldn't make sense for Steel Cyclone Studios to work under a big company name. You will have to provide me a lot more information. My skype username is jordon.mcclain if you would like to explain more there. I am working on getting the rights to the game studio name my friends and I are trying to start. Once we get the rights, then we will publish our business website and start an indie page for the game we are currently working on using this game engine and a page for the studio; our business. We might also make a page for this game engine as well.